"Right on the Beach!" 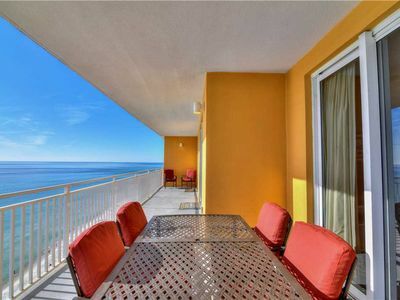 - Beachfront with GREAT Views and PRIVATE Beach - WOW !! NOTE: WE HAVE NO DAMAGE FROM HURRICANE MICHAEL AND OUR BEACHES ARE FINE. SO COME AND ENJOY! 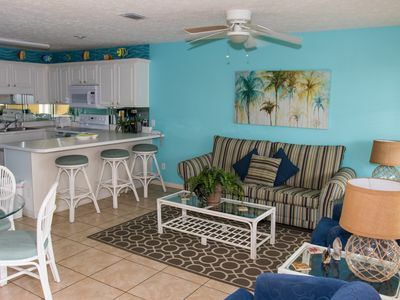 We have LOTS of info in the writeup below, but if you are in a hurry or on a mobile device, contact us and we will answer all your questions about our beach condo, availability, area info, rental costs and even fishing tips - plus you can book your reservation online!! Can't get any simpler than that! Enjoy crystal-clear waters and sugar-sand beaches that actually squeak when you walk on them (really) and sunsets that will take your breath away!! Our beaches are consistently rated among the best in the U.S. and for good reason. Calm, clear waters. Smooth, soft sand. Gently sloping, shallow beaches. And an abundance of wildlife ranging from dolphin to manatee to sea turtles, and even redfish can all be seen from our decks! Secluded and yet right in the middle of all you could want, "Right on the Beach!" 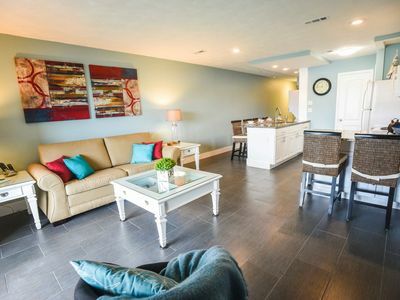 is a No Smoking, two bedroom, two and a half bath townhome is perfect for families and those looking to relax and enjoy the finest beaches in the United States located right outside your door!! 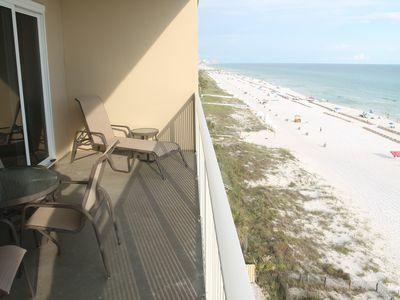 Relax on one of two decks looking out over the beach and Gulf of Mexico. 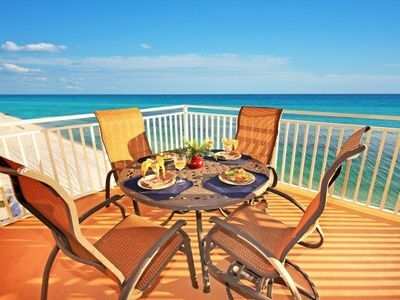 Enjoy the best sunsets Florida has to offer from the deck outside your bedroom! "Right on the Beach!" 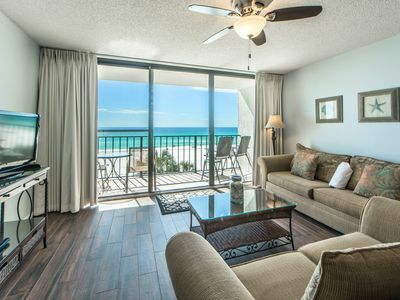 is in Seagrove Beach, Florida (on the Panhandle) and is a part of Walton Dunes Townhomes. 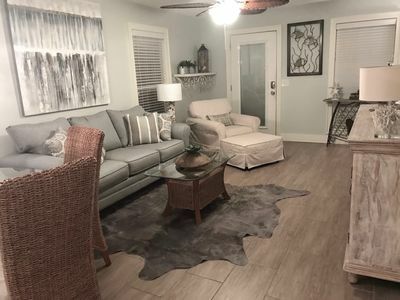 It is located south of scenic Highway 30-A, next to Deer Park, on a secluded stretch of the Emerald Coast, but only minutes from golf, shopping, restaurants, and fun for all!! 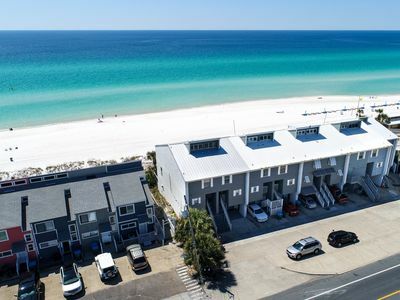 Seagrove Beach is approximately halfway between Destin and Panama City Beach, and only minutes from Seaside, Grayton, Alys and Rosemary Beach. For those unfamiliar with this part of the Florida Panhandle, the beaches of 30-A are known as the Emerald Coast because of the unique clear-to-turquoise waters and sugar-white sand of its beaches. It is also known for its natural beauty, the lack of high-rise condos and a relaxed, family-friendly atmosphere. No over-commercialization here. 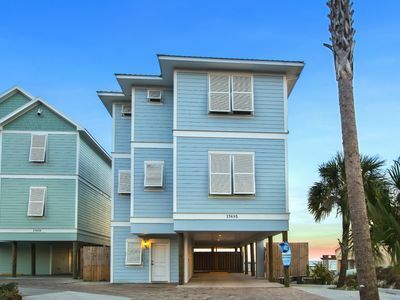 Walton Dunes is a small (17 unit) townhome complex, located right on the beach and away from busy roads, traffic and noise. Walton Dunes is on a quiet, secluded stretch of beach in South Walton County, right next to 2 miles of undeveloped beaches (Deer Park). Nothing but beauty and solitude here. 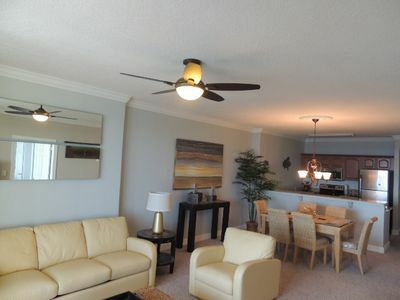 Other Walton Dunes units are also for rent, so multi-family groups can easily be accommodated. 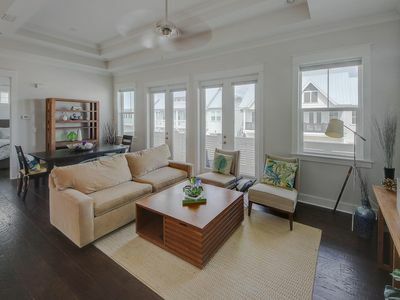 Our Walton Dunes townhome is named "Right on the Beach!" because it IS right on the beach, with nothing but sand, surf and sun in your view when looking from each of our 2 roomy, covered decks. Walk out the door and you are ready for fun!! Fish right from the beach, rent bikes, go for a swim, or raft in the waves. Or just wander along the beach and enjoy the view - it is up to you. Just bring plenty of sunscreen! Or, of course, you can always just relax and get reacquainted with that special someone while watching the waves or the sunset. That's one of the best things about our beach - we have the solitude others lost long ago. 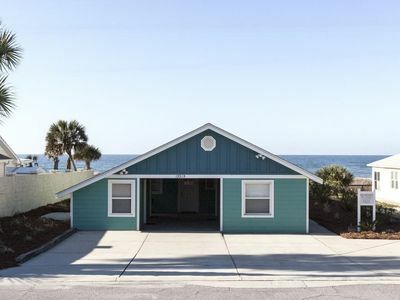 Enjoy the convenience of reserved, drive-under parking (no crispy hot cars), an outdoor shower to keep the sand outside, a full-size kitchen, and full-size washer and dryer. 3 new flat-panel TVs and 3 video players and CD player/radios are provided along with a selection of videos, CDs, tunes, puzzles, books and games included for you and the kids to enjoy! There is even a blender for those tropical drinks that just seem to be necessary while at the beach! "Right on the Beach!" sleeps six, but unfortunately cannot allow pets. It is a non-smoking environment. Equipped with all linens, and an initial supply of necessities (paper products, etc. ), all you need bring is family, friends, food, drink, and a desire to enjoy the vacation of a lifetime. We are within a day's drive of most major southern cities. We also have direct airline service with Delta, Southwest and other airlines. We typically rent Saturday to Saturday. We offer discounts for off-season multi-week stays. Please book early to ensure availability. "Right on the Beach!" 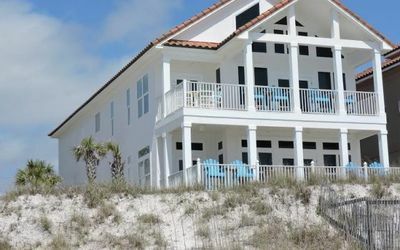 features Two Bedrooms, Two and half Baths, One King and Two twin beds, Queen sleeper sofa, Central Air Conditioning, two decks overlooking the Beach/Gulf of Mexico, exceptional views and sunsets, outdoor shower, ceiling fans, 3 flat panel TVs, 3 video players, CD/radios with beach CDs and more, puzzles, books, DVDs/videos and games for the kids, linens, full-size (and fully equipped) kitchen, full-size washer and dryer, dishwasher, ice maker, microwave and drive-under parking for 2 cars (so no more crispy-hot car seats!). At "Right on the Beach!" you can snorkel in crystal-clear water right in front of your deck!! Minutes from golf, shopping, dining, and fun!! Fish right out your door!! Pompano, Redfish, Spanish Mackerel, Bluefish, Bonito, and more can be caught right in the surf! Bring your rod!! We can even tell you what lures to use! "Right on the Beach!" and Walton Dunes Townhomes are located just half mile south of 30-A - away from traffic, at the end of Beach Front Trail - perfect for children. Located next to Deer Park so no crowds! Many enjoy our area because of the bike paths - ride to Seaside, Rosemary Beach, Alys Beach or Grayton Beach! Just contact us and we can recommend vendors who'll deliver rental bikes, baskets and helmets to your door and pick them up after your departure (very handy!). 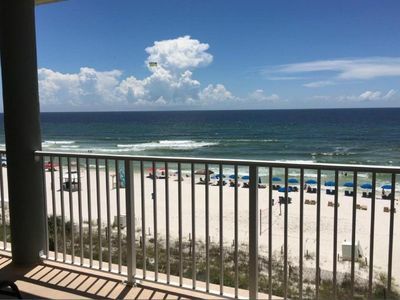 By car, travel 15 minutes to Destin, Fort Walton, or Panama City Beach for golf, shopping or deep-sea fishing, visit the new Pier Park and have a Cheeseburger in Paradise at Jimmy Buffett's Margaritaville while watching the waves roll in from the rooftop deck. There's also a huge outlet mall in Destin (Silver Sands), and much, much more. Many, many activities are available here on our beaches - so contact us with questions - we are glad to help plan your vacation of a lifetime! You can use credit cards with the online BookIt payment feature on this website. Note that online payments have a fee paid to VRBO for using their system. This fee is paid to VRBO and is not a fee charged by us. Please contact VRBO for more info on this fee. Please note we do not offer this rental to anyone under 25 years of age. We do verify ages before & during the rental. The names and ages of everyone in the group must be provided prior to rental. 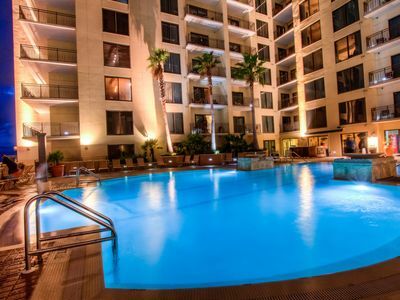 We do not allow any overnight guests that are not on the lease. All individuals staying any night MUST be listed on the lease - No exceptions. Please also note that with the exception of winter multi-week/monthly rentals, this property rents weekly, and does not offer itself to long-term renters. 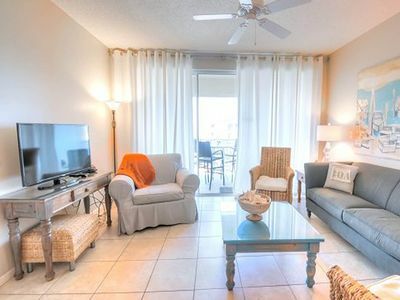 Horizon South Resort- Closest to the Beach! 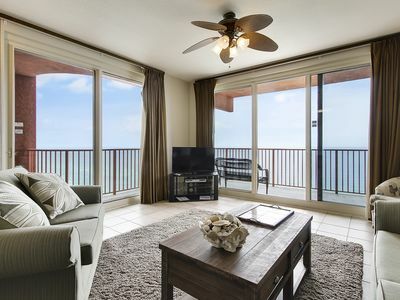 Luxury awaits in this breathtaking condo with never ending views of the Gulf! Brand New! 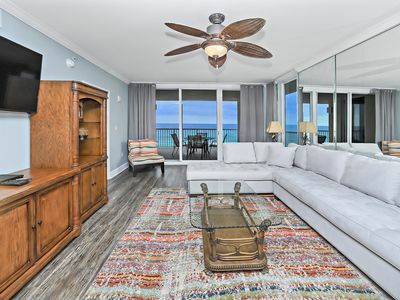 Beach Front/gulf Front-modern 2/2- Lowest Price!!! Free Wifi!!! 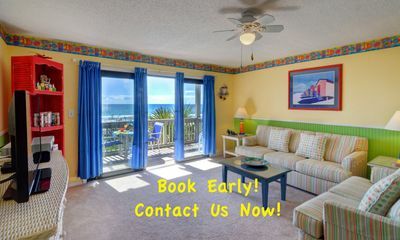 Sterling Reef 0505 - Booking spring vacays, now! Complimentary Beach Chairs in Season! Charming Secluded Area of Seacrest! 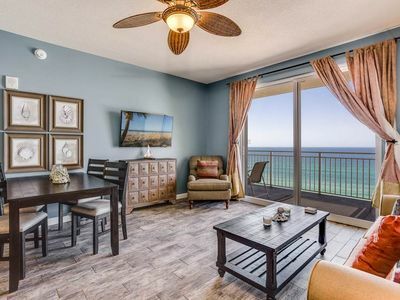 ☀Gulf Front Luxury☀Edgewater Tower 3-307- Salon+Spa!- OPEN Apr 13 to 15 $578! Origin 1429! 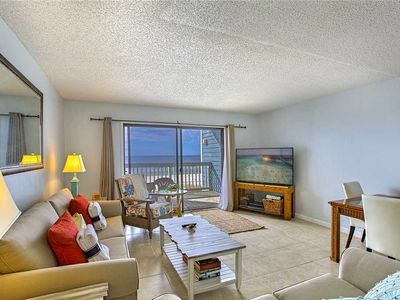 Beach Studio Perfection with Outstanding Views By ZIA! Free Shuttle to Beach! Townhome in Prominence Sleeps 6 with 2 Bikes!